The default patterns will color build errors in red, warnings in yellow/gold and successful build messages in green. Download and open the VsColorOutput.visx file. 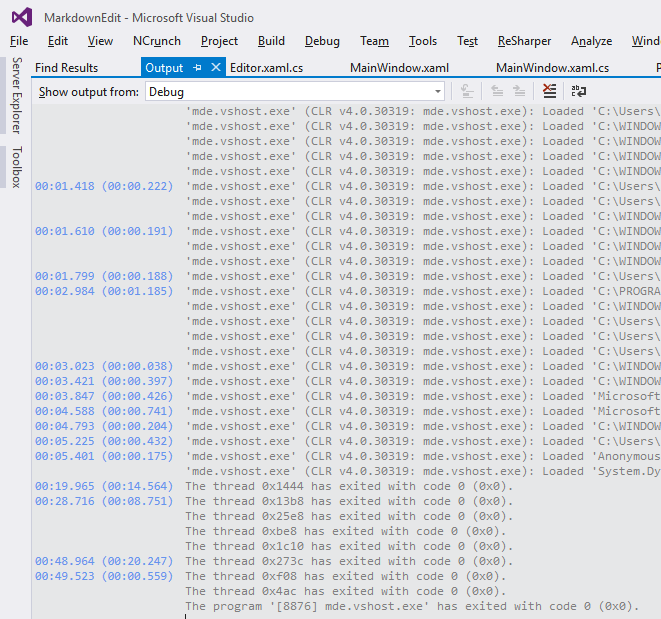 VSColorOutput supports Visual Studio 2010/2011. You can also install it from the Visual Studio Extension Gallery. To uninstall, go the Tools|Extensions page, find VSColorOutput in the "Installed Extensions" and click uninstall. The settings file is not removed. VSColorOutput hooks into the classifier chain of Visual Studio. This allows VSColorOutput to monitor every line sent to the output window. A list of classifiers, consisting of regular expressions and classifications is checked. The first matching expression determines the classification. If no patterns match, then the line is classified as BuildText. From here, Visual Studio does the heavy lifting of mapping the classification to a color. Settings are stored in a separate file %AppData%/VSColorOutput/vscoloroutput.json. I originally wrote VSColorOutput to highlight trace output while debugging. It's still the primary reason I use it. I discovered it also highlighted lines in the build window as well. I found this made it much easier to visually parse the output and quickly locate items of interest. Colors are set in the Tools|Options|VSColorOutput dialog. The names reflect their intended use but are arbitrary in actual use. Build Text is the default classification for any line that does not match the other patterns. Its default color is "Gray". I've found this helps to highlight the other classified lines. 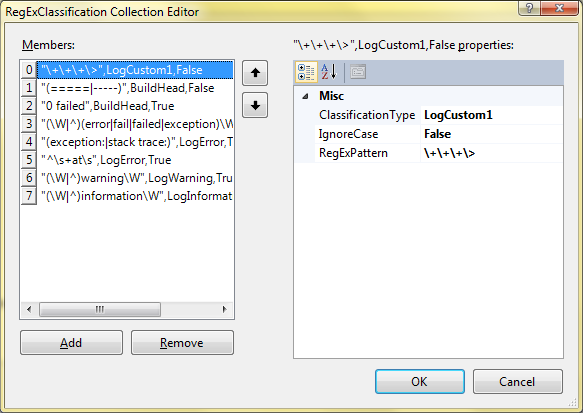 The RegExClassification Collection Editor dialog contains the classification pattern settings. It can be opened via _Tools|Options|VSColorOutput|General|RegEx Patterns \[...\]_. At run-time, VSColorOutput will walk this list in order, testing the line of text against the regular expression. If it matches, the line is given the classification associated with the pattern. No additional patterns are tested for the given line. Therefore, the order of the classifiers is significant. As of 2.2.1 you can optionally show timestamps in your output. Pretty much does what it says. A real time saver on larger projects. If you build from the command line, MSBuild tells you how long the build takes. Building within Visual Studio does not. Why? Don't know. It's always bugged me so I fixed it. Visual Studio has a "Show Build Window when Build Starts". Now you have one for the debug session. If you run your debugger output in a tiled window, this won't have much effect. If you run it in a tabbed window (like I do) then this setting will activate the debug window saving you a few mouse clicks. Stored in %AppData%/VSColorOutput/vscoloroutput.json. Share them with friends and family (and other developers too).